Harley-Davidson officially “revealed” the 2015 Road Glide this morning along with an updated web site with some additional details. The “reveal” is a peculiar twist given that we’re a few weeks away from the typical new model launch window. Here is the corporate press release announcing the 2015 Road Glide. I’m sure it’s just the first stage of a lot of hype and media buzz planned for the traditional post-Sturgis announcements. Or being a bit skeptical of marketing motives… maybe this H-D reveal is simply a tactic to take away some of the headlines from the 2015 Polaris, Indian and Victory news? Back to the Road Glide. There are two models. The Road Glide and Road Glide Special. Both models include the same specifications from Project RUSHMORE that is currently available on 2014 touring models. There is the air-cooled, high output Twin Cam 103™ with integrated oil cooler mated to a 6-speed cruise drive transmission, the new Reflex anti-lock braking system (ABS) with dynamically, electronically linked brakes for optimum braking in all conditions. 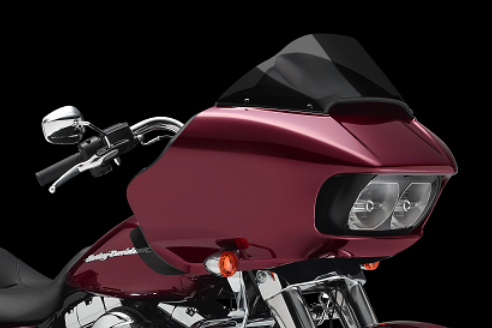 Both Road Glide models include the redesigned saddlebags for a sleeker look and added new latches that you can operate with one hand. The 2015 Road Glide Special is basically an elevated experience of riding that includes the new Boom Box 6.5 infotainment system which features a 6.5″ full color touch screen display and it can be operated by convenient new hand controls or by voice command. It also includes display color options: Orange (default), Blue, Brown, Green, Gray, Purple, Red. There’s a new handlebar on the Road Glide motorcycle for 2015 that makes the riding position more comfortable for a wider range of riders and the hand grips are now 5 1/2″ closer to the rider. There is also new gauges which has a 10% larger speedometer and tachometer with 68% wider numbers; 28% larger fuel and volt gauges with 30% wider numbers. Most distinctive is the new triple-vented fairing that opens and closes to equalize pressure in front and behind the windscreen. 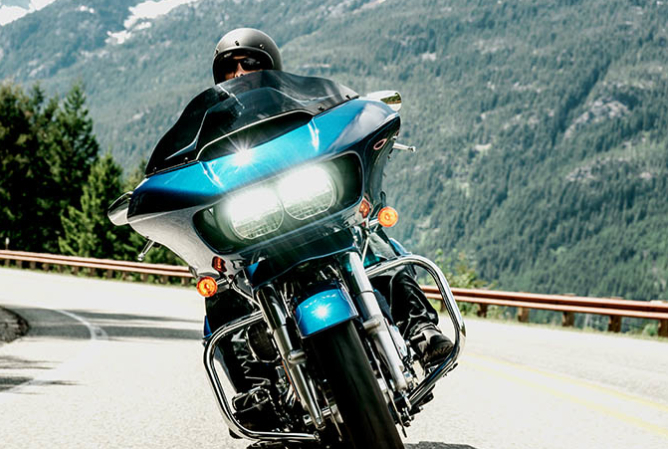 Lastly there is the new dual Daymaker LED headlamps providing better nighttime riding visibility. I’ll be interested to experience how easy it is to reach and adjust the infotainment system. Previously anyone under 6 feet tall could have an issue reaching up to the radio system. I’m looking forward to seeing the new 2015 Road Glide at the local dealer. Note: If you’re tracking or curious how accurate any of the previous blog posts were: Road Glide spy photos HERE. Early 2014 Road Glide speculation HERE and HERE. With the rich history that Harley-Davidson has, the company rarely takes a big chance, but on occasion has celebrated a new model now and then. You might recall that recently the motor company rolled out a range of new 2014 touring models. However, Harley-Davidson informed the riding community that there would be no Road Glide Custom or Road Glide Ultra in the 2014 line up due to the “fact” that their tooling on that model’s fairing is antiquated and wasn’t intended to be used for the volume of sales that the FLTR’s have been generating. This seemed like a rather lame excuse to many in the ‘Glide’ riding community given how quickly new tooling can be executed and there were whispers of a marketing ploy. So, jumping aboard the speculation train… I recently received this photo of what appears to be a pre-production 2015 Road Glide fairing. It provides some insight into what’s planned for the model when it gets re-released in 2015. The fairing showed up on eBay for a day then was quickly deleted. The speculation is the fairing was stolen by an employee of the Harley-Davidson vendor responsible for making the fairing. Nobody has facts, just speculation. 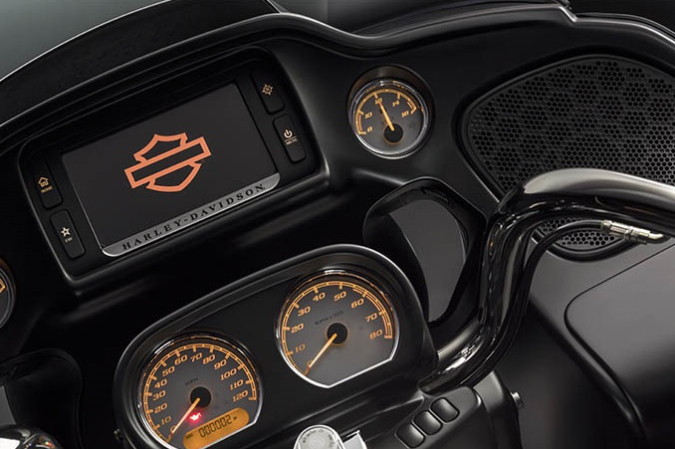 I would argue that it looks to be on track to what we would expect from Harley-Davidson given the cut out for the 6.5-inch color touch screen. What do you think? It’s an internet concocted rumor or hints of what’s to come? 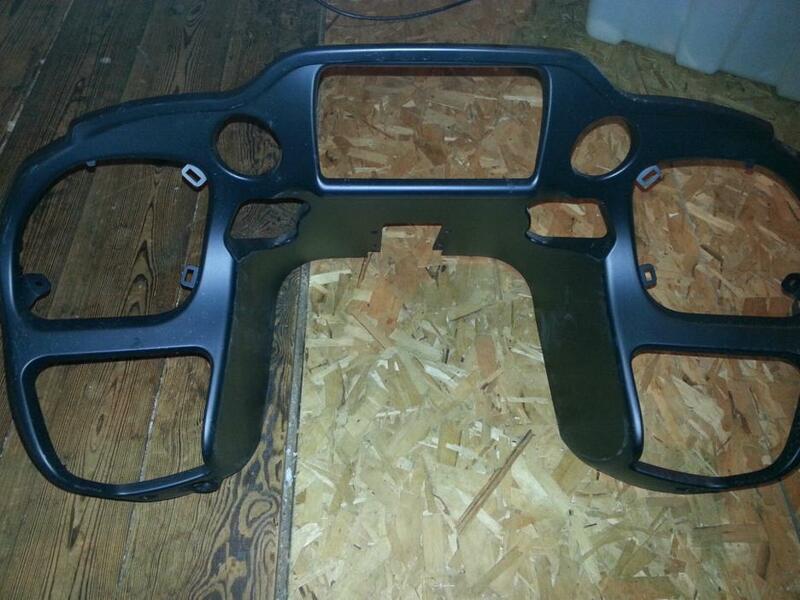 UPDATE: July 8, 2014 – “Official” spy photos of the 2015 Road Glide are HERE. UPDATED: August 1, 2014 – Harley-Davidson officially reveals the 2015 Road Glide.